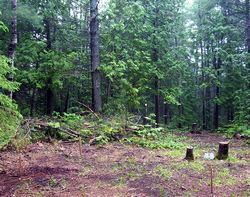 This web site is a collection of personal experiences and useful resources I have found when building my own small cabin in the wilderness. 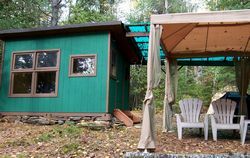 I hope it will be useful for people who want to do the same - to build a small cabin on their own - so they will have a quiet retreat or hideaway spot to enjoy their weekend or vacation. My family and I love the outdoors. We have enjoyed many camping and nature exploration trips, hiked trails, and visited nature conservation areas and wilderness parks. Building a small cabin in the wilderness was a natural extension of our outdoor pursuits. 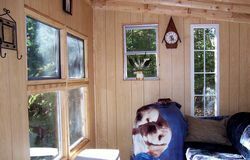 When I started to build my small cabin I searched for information, but could not find one concise, clear and complete guide on how to build a small cabin or a small cottage using only my own skills and resources. This web site aims to be such a guide. I do not promote any cabin building kit, material supplier, construction business or service provider, but I will mention particular resources, tools and materials I used. 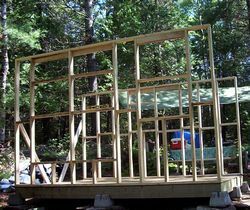 I built my small cabin from scratch, using materials readily available from local building material suppliers, and without any special skills or training. But before I started, I did my research homework! Advance planning will save you time, effort, and money. No building permit required (optional). To have a feel of the great outdoor living and wilderness experience. Discuss your own project with others like you - ask questions, share experiences, and post pictures of your own cabin! Please keep in mind: this small cabin site is a continuous work in progress. I am constantly adding new information, tips and experiences as I learn new things and continue building. 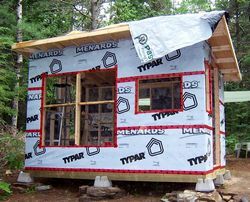 I also aim to add many comments and suggestions as possible from web site visitors - other small cabin builders. Also, if you are considering a larger structure, like a small cottage - conceptually it is similar to the building of a small cabin as described here. So you can use most of the information on this site. To build a small cottage you still need to know how to build a foundation, walls, roof, etc. The difference is that you may want to have more rooms and acquire services like electricity, which require building permits. I've tried to make this site as easy to navigate as possible. Use the links on the left side navigation bar to dig into details, or follow page-by-page links at the bottom of each page. Start planning, building and enjoying your own small cabin somewhere in the wilderness... And don't forget to share your thoughts in our Small Cabin Discussion Forum - you're sure to find many like-minded people there. I hope you will find this web site useful.